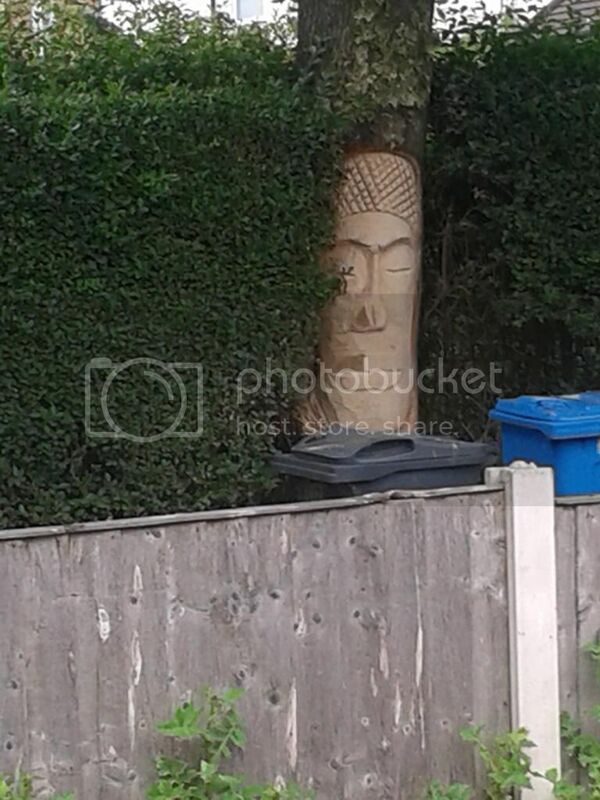 I came home last week to find my neighbour has had someone carve a large face into the ash tree 3m away from ourhouse and spray painted symbols on the tree farthest away from the house intending to carve that too. When we moved in in 1999 the house next door was unlived in. We moved in tidying the garden, two days later a note was pushed through askingus not to touch the hedge on her side or the ash which was in hers but we could do what we liked with the tree at the bottom as that was ours. We accepted this and have always maintained the bottom tree completely whilst only taking branches off the ash on our side as she has refused to let us maintain it even when we have offered to pay for it. When my husband asked why she had spray painted our tree her reply was she did not know it was our tree! 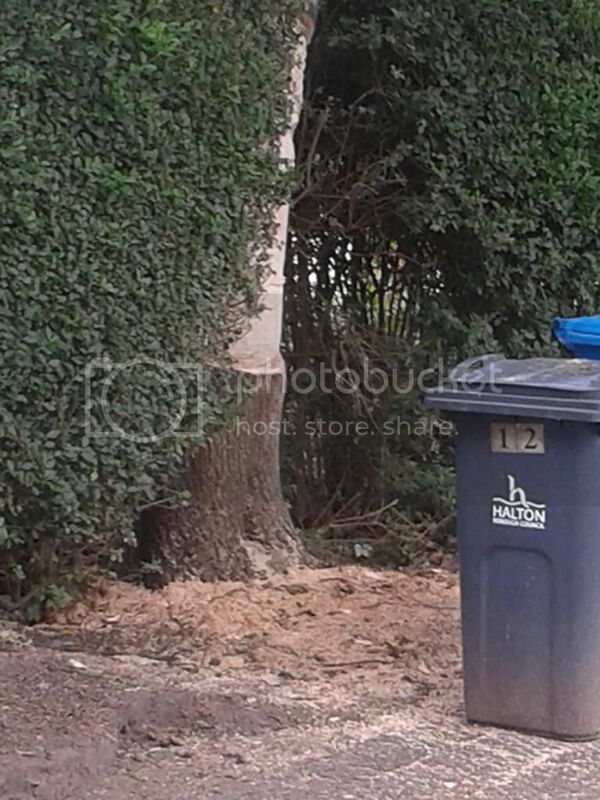 On contacting the local council they said they couldn't intervene as it was on private property and not subject to a tpo but the tree would undoubtedly suffer from the severity of the damage and that we should be certain that it isn't a boundary tree. We think if it went to court tomorrow it would be judged as on the boundary. Personally we don't much care who owns it we just want to be sure we won't be held liable should the tree or bits of it cause damage to property in the future because of the damage she has inflicted. Thoughts? once you've submitted 3 postings you'll be able to include links to images. I think a plan would be helpful. how was the tree accessed? How do i do that? have been trying to add photos but it keeps saying the file is too big. 1. new members can not do certain things until they have submitted 3 posts. Thank you Mac, will sort that out when i get home from work tonight. MacadamB53 wrote: I think a plan would be helpful. why would anyone do that?!? That is on her side of the garden, about 50% round. She has now pushed a note through saying she owns this tree and we own the bottom one. She also says they took advice before carving and they were told that it wouldn't damage the tree. Advice from whom i wonder - the tree carver she was paying perhaps? has your tree been tampered with or not? Ask for a TPO on HER trees. I think that will mean if ever they have to be felled, she will have to replace them. Is that correct? We think it is on the boundary Mac. However in an effort not to cause ill feeling with a new neighbour nearly 15 years ago we agreed she had ownership of the ash. She has now (since my first post) put in writing that she has ownership of the ash and we have ownership of the oak. Is this enough to protect us from legal liability years down the line. We know nothing will happen overnight but all the advice we have had so far matches what you have said on here - that it will go into decline. This tree is well above the roof line and even if one of the branches came down would create damage to property without a doubt. is it the same tree in the two photos? LJW wrote: We think it is on the boundary Mac. However in an effort not to cause ill feeling with a new neighbour nearly 15 years ago we agreed she had ownership of the ash. She has now (since my first post) put in writing that she has ownership of the ash and we have ownership of the oak. Is this enough to protect us from legal liability years down the line. We know nothing will happen overnight but all the advice we have had so far matches what you have said on here - that it will go into decline. This tree is well above the roof line and even if one of the branches came down would create damage to property without a doubt. She has claimed ownership and admitted to damaging the tree. How much clearer could that be? Just keep the paperwork and drop her a line acknowledging that she claims ownership of the tree and outline your concerns that the carved area could be a problem for the future. Get a lawyer to draft it for you if you want to be sure.